I got into drag racing through a couple of a avenues, one being my father taking my brother and I to the Autolite Nationals at Sonoma as kids every year for 10-plus years. And second through my uncles having muscle cars when I was a kid. First race in a drag car would have been the Streetcar Takeover at Tulsa Raceway Park. The car is a 1964 SS Malibu that was built in Kansas City. I call the car ‘Ole Rusty. 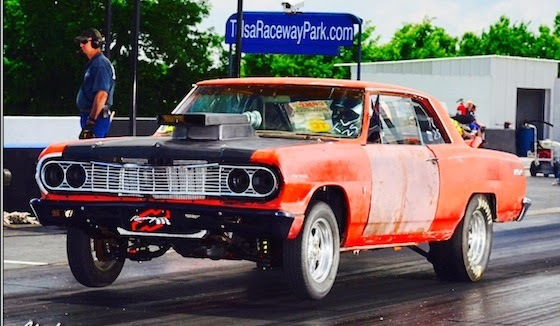 Welcome to our Car of the Week series, where we feature BTE customers and fans, and the cars (and trucks) they love to drive and race. We’ve taken a small break from the series, but we’re back today with the winner of our recent [epic!] Wheel Stand Tournament. It was a hard-fought battle, and Derek Lewis was grand prize winner with a massive amount of support. Here’s his story, and his car. Hanging around friends in high school. 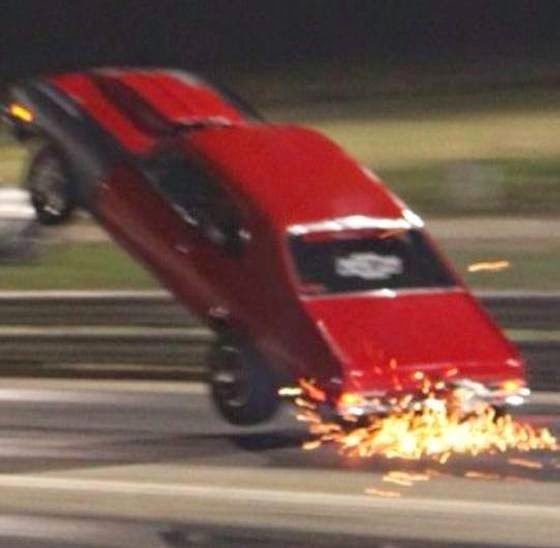 "Ole Red," but most people know me or my car by 582nova. Ever thought, "I wish BTE would compile a full list of all the technical information they've put up on their blog in one post, so it's easy to access and find?" Well, today is your day. From torque converters to exploding bellhousings, we've indexed all the technical content we've posted over the years. As we create more, we'll add them to the list so all you have to do is bookmark this post and check it periodically. Thanks for reading! How Often Should You Change Transmission Fluid in a Racing Automatic Transmission? What Types Of Yokes Work Best With A Roller Bearing? When should you upgrade to eight (8) or ten (10) clutches in your powerglide transmission? When building your own racing transmission, there are some absolute rules and tools for a successful assembly. Strong, reliable components that are designed for high performance applications by companies like BTE. Always research the company's history and experience with racing transmission design and manufacturing. Snap ring pliers, torque wrenches, sockets and a good hammer should always be in arm's reach at a building table. Cleanliness counts! A clean work area and clean parts should be the priority. Any amount of dust, grime, metal shavings, or even hair can cause a moving valve to stick or drag. 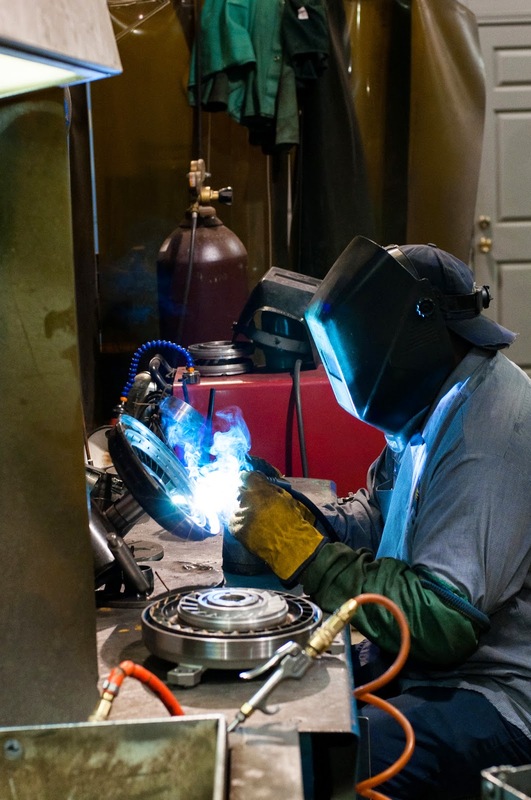 At BTE, we wash parts in a hot steam pressure washer and also uses solvents and media blasters when required. Design a workspace that is comfortable and accessible. A work table that requires you to bend over or reach too far can be a headache (or a backache). Good, clean lighting is also a must for seeing details on component parts and for making difficult part installations go more smoothly. The "right" tools for the job are critical, but having a few *extra* tools doesn't hurt. 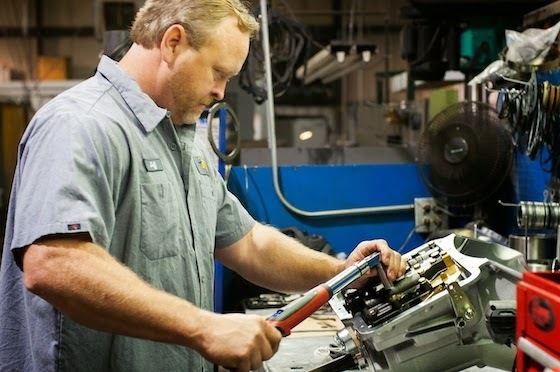 A lathe for machining pistons, seal installers, ring compressors, an air compressor for testing seals, and a dyno testing machine for trouble shooting are used by our builders every day to help with the perfect assembly. Don't forget the assembly lube! A small amount of grease is required for many seal and other component installs. We like Life Automotive's Trans Prep. Think outside the "box." When troubleshooting, always consider the external forces at work on the automatic transmission. From the electronics to the differential and tires, the automatic gearbox is affected by any out of the ordinary operation from its mated component systems. We encourage more racers to manage their own transmission building and service. It's a rewarding (and potentially money saving) experience. Have any suggestions of your own? Please post them to our blog! BTE recommends that every racer monitor their transmission's line pressure and regard it as important as the oil pressure in their race engine. Automatic transmissions rely on the pressurization of their internal systems to operate properly in each gear range. Forward, reverse, and gear shift quality are largely dependent on the level of hydraulic pressure regulated by the transmission. 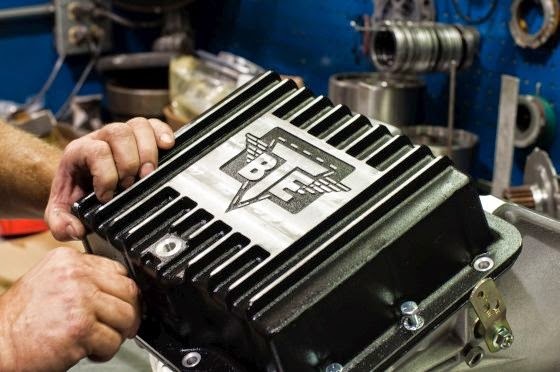 In a race-prepped powerglide transmission, BTE recommends at least 210 to 255 PSI in all gears. These circuits can be measured at the transmission servo port and the reverse port. The increased pressures can be achieved by installing a stronger spring in the valve body's pressure regulator or by installing a complete valve body kit, like BTE's Top Sportsman valve body. Higher pressure reduces shift lag and helps maintain friction clutch pack life. The cooler circuit should also be measured. In a powerglide, most setups should see anywhere from 45 to 100 PSI. This will vary depending on the input shaft, pump, and converter combination. Transmission line pressure testing is also a great way to diagnose the internal condition of a transmission. Inconsistent pressures or lower than expected pressures can indicate an internal leak or broken seal. If pressures are slow to build when the engine RPMs are increased, this may also indicate a worn or failing pump. We recommend using the BTE high volume pump for more consistent oil pressures. As pressure varies, the car's performance will be inconsistent. For a bracket racer, this is an essential test to perform on an ongoing basis. Consistent and high hydraulic pressure will keep your high performance racing automatic transmission going strong weekend after weekend. As always, contact us for specific recommendations for any custom racing transmission configuration. Automatic racing transmissions operate in much different conditions than their street driven relatives. Racing units are designed and built to have much firmer shifts via high hydraulic pressure, the gears and shafts are made from steel developed by the military and space industries and the valve bodies are reconfigured to allow transbrake or second gear launches. The minimum requirements for today's high power race engines means that very few of the original OEM components are used in a modern racing transmission. 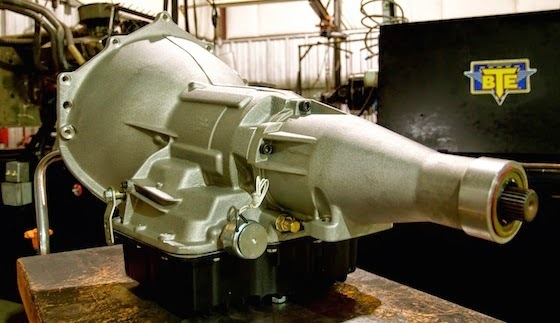 In fact, our Top Sportsman powerglide transmission uses no OEM components - from the input shaft to the output shaft, every major component is new and designed entirely for drag racing usage. The valve body controls the operation modes in an automatic transmission. 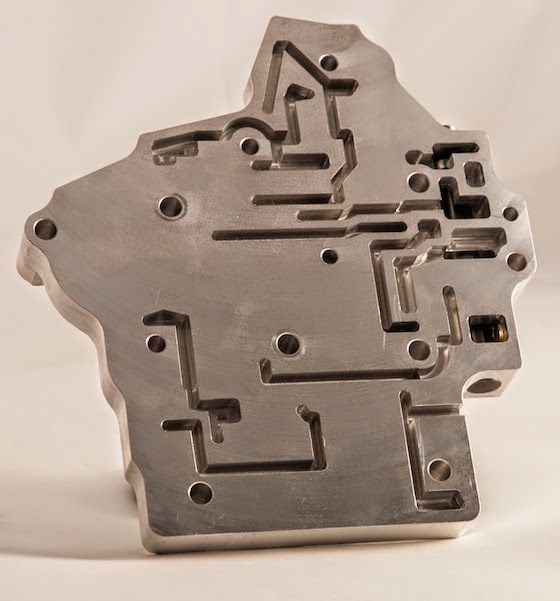 It is a complex assembly of channels, valves, separator plates, springs, and gaskets. Keeping the entire transmission clean and free from contamination. Replace your filters regularly. In the event of torque converter or other component failure, be sure to disassemble the entire valve body and clean thoroughly. Any amount of debris can cause valves to jam or wear prematurely. Always run a transmission cooler or radiator. Excessive heat can cause valve clearances to become too tight or too loose creating wear or leaks. Two piece valve bodies should always be properly torqued to each other and to the transmission case to ensure proper sealing. 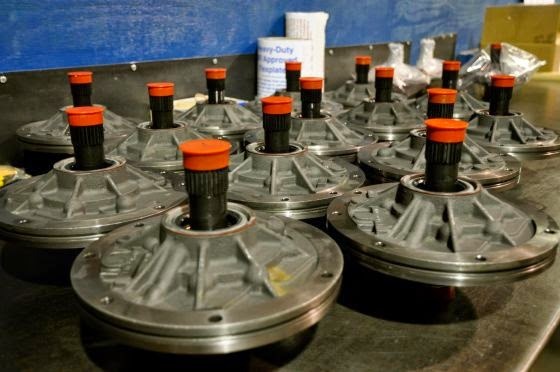 Check with your valve body manufacturer for correct torque specifications. Valve bodies that contain internal pressure regulator springs need replacement over time. Pressure levels may drop after many cycles of usage (which cause the springs to weaken). 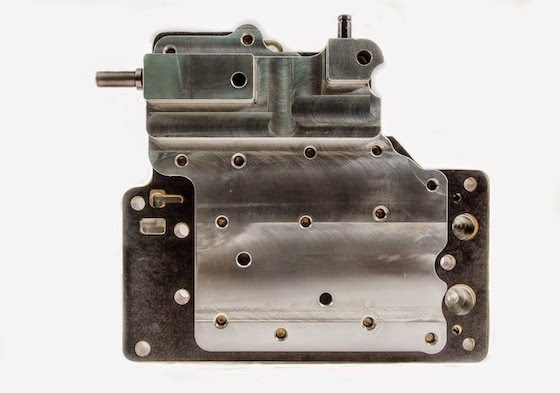 Continuing our profiles of our signature racing products, this week we are focusing on valve bodies. 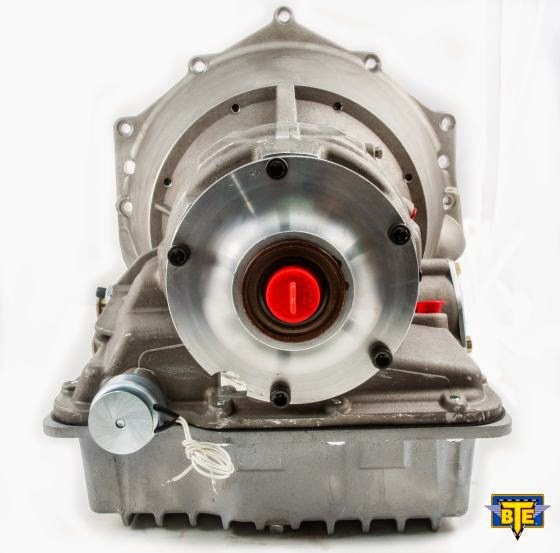 BTE manufactures a number of all new billet aluminum valve bodies for powerglide and TH400 transmissions, a new cast powerglide valve body, and we also modify OEM units for high performance usage. 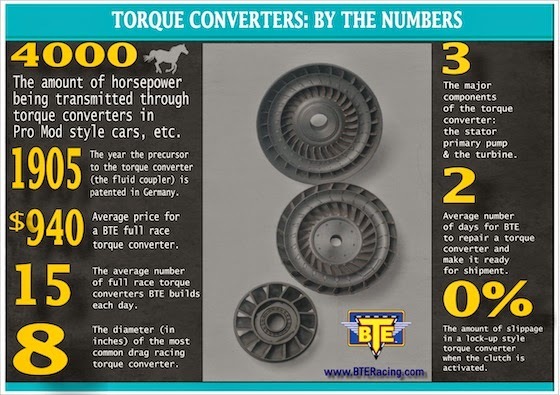 What Goes Into the Design and Manufacturing of a BTE Torque Converter? As we mentioned before, every racing torque converter built today (even the $8,000.00 billet aluminum lock ups used in Pro Mods) has its designs rooted in an OEM torque converter. The popular 8" torque converter is based on design from Opel that is more than 30 years old, and the popular 10" 258mm and 265mm billet converters are based on designs used by Cadillac for its Northstar series vehicles. Using these platforms as a core, we build upgraded component parts that increase strength and modify the torque multiplication and stall speeds. CNC machined covers or fronts are made from 8620 steel or 6061-T6 aluminum. The higher grade materials increase the strength of the converter and eliminate "ballooning" which can occur when stamped steel front covers are used. 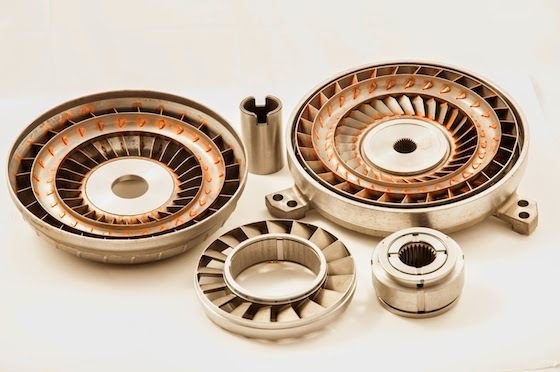 The individual fins or blades within the torque converter primary pump and turbine are furnace brazed. This process bonds the metal components together and prevents breaking of the blades. The stator assemblies in most OEM converters contain aluminum castings and simple spring based roller clutches. These are upgraded with billet steel stator assemblies with upgraded multi cam sprags, mechanical diodes, or solid spragless slugs. OEM input shaft splines are cut out with CNC precision and new heat treated splines are welded into place. 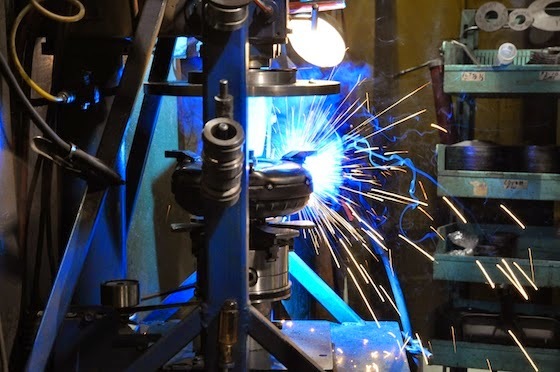 The torque converter is reassembled with the upgraded component parts, endplay and runout are checked after welding, and a final balance test using a computer balancer makes sure the torque converter will run without any vibration. A final multi point inspection by three specialists ensures the torque converter is built to our racing specifications and is ready for painting and shipment.